300 000 of people have visited Piotrkowska Street during the Light. Move. Festival. This is one of few periodical events, gathering such a huge audience and bringing life to the main street of the city. 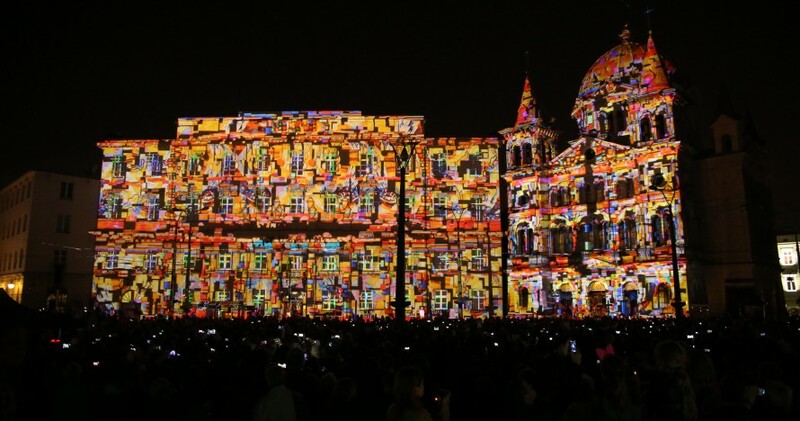 3 days, 10 3D projections, 15 light instalations amd 40 architectural illuminations. All watched by over 300 000 people from all arround the Poland. This is the absolute high score of festiwal. City Police reports no claims about thefts, fights or any other kind of troubles in the festival area. Traffic Police was more busy – on Friday the additional support was required to bring back the fluent traffic in the city centre. On Saturday and Sunday both – citizens and tourists more often decided to use the public transport. Here comes a new tip for the organizers and the City of Łódź – next time it would be worthy to show not only Piotrkowska Street but also the larger part of the city. The Festival of Light brought to the streets not only the citizens, but also guests from Poznan, Warsaw, or Pomerania region. Such a crowd was not seen at Piotrkowska Street for a very long time. To have more events like this at Piotrkowska Street we need more creative ideas. The City of Łódź is supporting such events but it is not the organizer itself. The council offers help, support and encourages and today is waiting for new projects.